“Harmonia” is an Israeli film that is shaped by layers of meaning and is satisfying on many sensory levels. 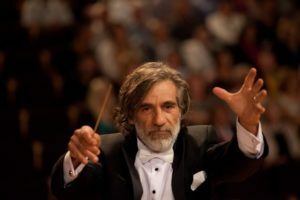 At first, you might think this movie is about music because it is centered on the life of an orchestra conductor and his beautiful wife, a brilliant harpist. But, no, it is about a modern-day couple struggling through years of infertility and the sadness that permeates their life. Actually, no, the movie is about a love triangle based on the biblical archetypes of Abraham, Sarah and Hagar — a contemporary interpretation of an ancient narrative about complex family dynamics and good intentions that turn into despair and disappointment. Alon Aboutboul portrays conductor Abraham in “Harmonia,” being shown Jan. 26 and Feb. 4, 9, 10 and 11. But still, no, it is about Harmonia, the love that unites all people, despite their differences, in the mess that is human existence. It is an enchanting film about love, sacrifice, betrayal and redemption. And, yes, it is also about music. I once heard a cantor say music is as much about the silence between notes as it is about the sound the notes emanate. The measured silences of “Harmonia” punctuate its story line as if written on a music sheet. The camera follows the characters up close to capture the slightest expressions and changes in mood and produces a performance brimming with sounds and rests. “Harmonia” is gentle on the viewer, much gentler than many modern melodramas. The story deviates from the violence of Genesis and reinterprets its characters through a lens filled with light. While Abraham is portrayed as a charismatic leader, he seems bound by some inner limitations. It is the women in the story who steal the viewers’ attention as they take risks and deeply feel through the consequences of their situation. And it is their children, Isaac and Ishmael, who are left to make sense of it all.